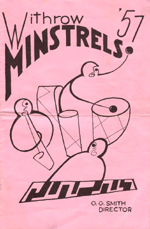 As many of you know, “Smittie” used many successful numbers repeatedly over the many years of The Minstrels. This 2 CD set includes selected numbers performed in the years 1950-1965. 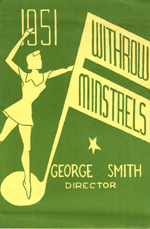 It plays much like a real show and includes Smittie’s 1965 farewell. Purchase audio recordings for the shows of 1953, 1955, 1956, 1957, 1958, 1959, 1960, 1961, 1962, 1963, 1964, and 1965. Each order includes 2 CDs and an original program for that year. The CDs also include two bonus tracks: the Band playing “On Withrow“, and the Band and Choir rendition of “The Christmas Processional and Adeste Fidelis” which opened each Christmas Concert.